Pari Sanyü Meyasetsu introducing guests from abroad during the inauguration of the Healing Garden at Medziphema in Dimapur on Jan. 27. 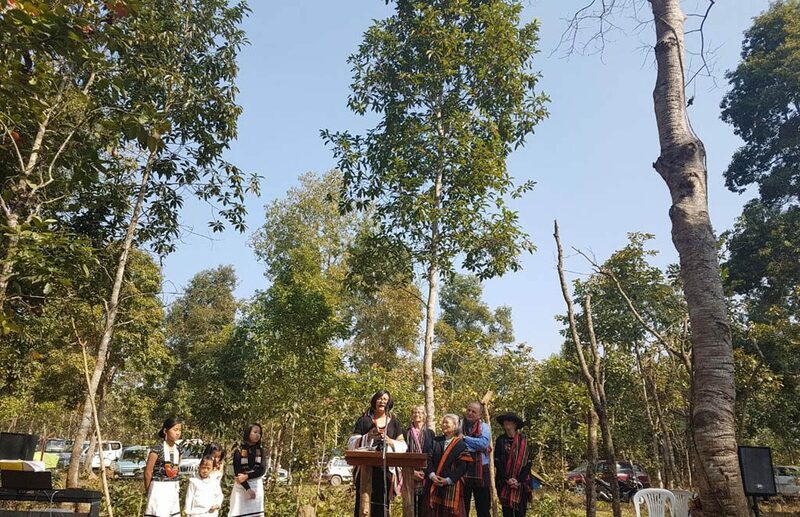 Besides family, friends, well wishers from Nagaland, the inauguration of the Healing Garden—located in Medziphema—saw guests from Ireland, Japan, and New Zealand lending their support and solidarity, updates informed in a handout to the media on Sun. Climate Scientist from New Zealand Alan Porteus was also there to address the event. Spekaing about his vision for the ‘Healing Garden,’ Dr. Visier Sanyü said that he had always wanted to return home after the long journey away. While acknowledging the opportunities that opened for him, he spoke also about experiences that were painful. For instance, the deaths of his siblings especially his older brother who was a “storyteller, a chanter, a repository of knowledge,” broke his heart. Six nephews died of drug and alcohol abuse, according to the updates. Expressing the desire to return home and give back something, he decided to make a healing garden to be enjoyed by generations to come. Also growing trees for future generations was the right thing to do, he said while expressing the hope that the healing garden will be a place for peace, tranquility, sharing and healing. Climate Scientist from New Zealand Alan Porteus in his inaugural address termed climate change as the biggest environmental challenge of the day and pointing out that “our way of living is damaging the world”. Pointing out that human kind cannot flourish without it, Porteus called for protecting the diversity of the natural world. 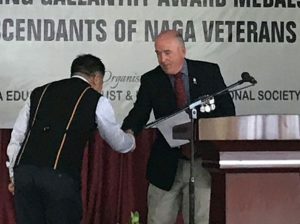 Alan Porteus who is a climate scientist with the National Institute of Water and Atmospheric Research, New Zealand, hoped that the healing garden and the vision set forth by Dr. Visier would bring about the “possibility of a new Nagaland” and with that the possibility of a world that works for everyone. Noted peace activist Niketu Iralu also shared his thoughts for the garden. “In Nagaland we are learning…exploring ideas for building a new world. The healing of our lives and rebuilding relationship is the most important responsibility”, he said and hoped that the healing garden will play its part. Earlier in the programme, peace activist from Japan Megumi Kanematsu said that after meeting her Naga friends, she had learned and understood more clearly the historical role of Japan in Asia, especially the involvement in World War II. She went on to admit that Naga people had suffered because of Japan. “The Japanese still don’t have the strength to put right where we went wrong”, she said while adding that “they (Japan) can learn from the strength of the Naga people”. Megumi also said that just like the trees which grow and live, we need to take care of the roots. She expressed appreciation on the work started by Dr. Visier Sanyü with the Healing Garden. And in this she mentioned how she was taught “to pass on strength to the next generation” through such initiative of the Naga people. Addressing the programme, Alec McRitchie from Ireland shared about his observation about healing. He cited the example of the visit of the present British Queen to Ireland in 2011, the first such visit by a British monarch in more than 100 years. According to McRitchie, the Queen expressed regret for the unhappy events of the past related to the Irish political problem. Another example of healing was of Masao Hirakubo, who fought in Nagaland with the Japanese army. However after the war, he spent many years promoting reconciliation with British veterans and was decorated by Britain for his work. On the healing garden, McRitchie said that Dr. Visier Sanyü was creating a “wonderful place to which people can come and reflect upon and find out what their life’s purpose can be”. Alan McRitchie was the European director of the Bombardier Aerospace, the largest aeronautical engineering company in Northern Ireland, the updates sttaed. He was mentioned as the current Vice Chair of Catalyst Inc, an innovation centre based in Belfast. The inauguration saw the attendence of a host of friends, well-wishers, and members of different church groups; organizations and villagers. Former General Secretary of the Nagaland Baptist Church Council Rev. Zhabu Terhüja said the prayer for the healing garden, the updates said.